Best Hunting Boots of 2019 - Men, Women, Rubber, & More! Best Hunting Boots of 2019 – Men, Women, Rubber, & More! There are many different important accessories and tools to consider when it comes to hunting, so it can be easy to overlook hunting boots, in spite of how essential they are for a safe and enjoyable hunting experience. Footwear is important for any outdoor activity since your feet carry you to a location and your feet are what hold you and your weight up for the duration of a day. The proper hunting boot will yield function, protection, and durability for specific terrain, or even multiple terrains. A good pair of boots is important for hunters and hikers alike, and there is sure to be the perfect boot out there for everyone. A good pair of hunting boots starts with quality material that allows them to be durable and wearable for multiple seasons. Hunting boot materials can consist of rubber, leather, nylon, and more! Rubber boots are a great option to consider if you’re looking for a watertight and easy to clean material. Leather makes for a very durable and comfortable boot, while nylon is known for being lightweight and breathable. The best hunting boots shouldn’t only be made of great material, but they should also be comfortable. A boot can be made of the most durable and water-resistant material, but if your feet are aching with every step, you’d be better off without them. Boots can offer different interior cushioning, and you can add insoles for personalized comfort as well. There are different levels of insulation a boot can have, making them ideal for various weather patterns. Boots with lighter insulation may be more suited for warmer weather conditions, while heavier insulation is best for colder and more wet conditions. You should keep in mind which seasons you most often hunt during and plan your insulation accordingly. With so many different types and brands of hunting or hiking boots currently on the market, it can be difficult finding a boot that best suits your needs. Luckily, we’ve compiled a list of different boots, from the best waterproof boots to the warmest and most insulated boots, even boots for kids. We’ve added details and features of the boots along with pros and cons in hopes to make your decision easier. Made of imported leather and fabric with a rubber sole, this dual texture boot features a notched shaft and eyelets. The camouflage-patterned fabric, waterproof and 1200 gram insulation allows these boots to be perfect inside and out. A prolonged outsole allows these boots to perform over even the most rugged terrain. The sturdy waterproof material ensures that your feet stay dry against rain and snow alike. Easy to break in and capable of fitting wider set feet, these are exceptional boots to take on an annual hunting trip or hike. Your feet are ensured to stay warm, dry, and well protected from any terrain in various weather patterns. 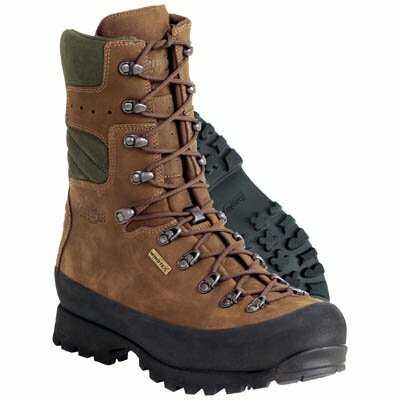 Overall, this is a durable and well-made boot that keeps your feet dry, warm, and protected from even the rainiest or coldest days, whether the terrain you’re walking on is flat or rugged and steep. A prolonged outsole provides traction, and the camouflage pattern is ideal for any hunt. This boot runs true to size and is comfortable for those with wider set feet. One thing to keep in mind is that this boot is a little bulky, but that doesn’t add any extra weight, so you’ll have no problem walking in them. Easy to break in, these are the perfect boots to take on your next hunting trip or hike. These boots are fleece lined, providing a durable and soft interior. Two millimeters of thermal foam under the footbed of the boots provide extra warmth for even the coldest days. A lightweight midsole gives additional cushioning, while the Bob-Tracker outsole is rugged and durable. Eight millimeters of neoprene provides long-lasting comfort and flexibility while also providing shock absorption. Along with waterproof and heat retaining properties, this boot is easy to break in and prevents blisters and chafing by molding to your foot shape. The shaft measured from the arch is 15.25 inches, and a stretch-fit topline fits snug to the calf and helps seal the top of the boot to keep the warmth in while keeping debris and moisture out. These boots are the best to wear if you plan on hunting or hiking in cold temperatures. Lined with fleece and with thermal foam under the footbed, they remain comfortable during long treks, while the stretch-fit topline and additional neoprene keep heat in and the cold out. One thing to keep in mind is that although these boots adjust well to the shape of your foot, they don’t fit wide set feet as well, and it is recommended to size up a bit, as they don’t seem to run true to size. This is a great pair of waterproof boots that are perfect for the winter so you can carry out all your outdoor adventures while keeping your feet protected and warm. Made from rubber and fabric with a rubber sole, these rugged boots are durable and able to withstand various weather patterns on your next outdoor adventure. 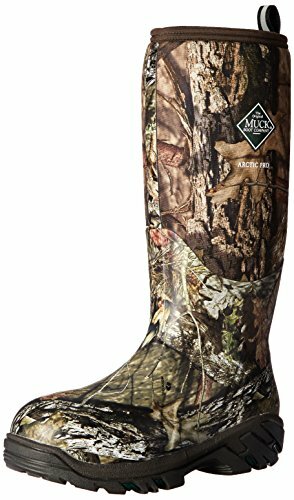 They are knee-high boots that feature a Realtree shaft in waterproof materials to keep your feet dry and protected from the elements. The airmesh lining is comfortable as well as insulating, and extra cushioning on the bottom along with flexible side walls allows these boots to be worn for multiple hours at a time while your feet stay comfortable and blister free. 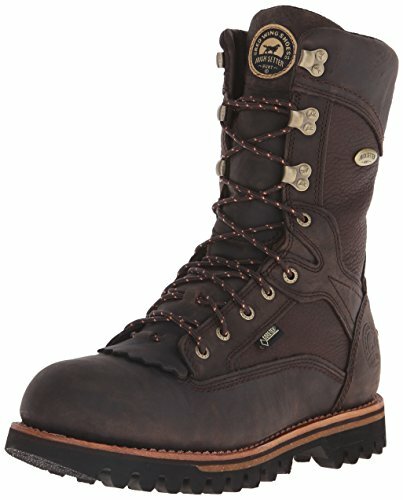 These boots are excellent for outdoor work, whether it be mud, rain, or snow, and they’re guaranteed to keep your feet dry, comfortable, protected, and warm. They do seem to be a bit lacking in traction, so just make sure to be careful where you tread! These knee-high boots are durable and sturdy with rubber and fabric material. The rubber sole doesn’t have the best traction, but they still provide a lot of support. Airmesh lining allows for a comfortable fit while contributing to insulation, ensuring that your feet remain warm in cold temperatures. Perfect for the outdoors, these boots have extra cushioning in the footbed as well as flexible side walls, keeping your feet comfortable for hours on end. 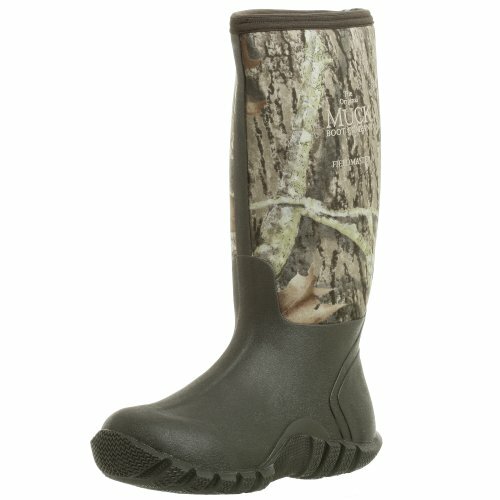 If you’re a fan of rubber boots, these would be a fantastic addition to your hunting or hiking trip. Made of 100 percent leather, these hunting boots have a removable cork EVA footbed with memory foam to ensure performance and comfort. The shaft measures approximately 9.5 inches from the arch, with the opening of the boot being approximately 15 inches around. Featuring 200 grams of 3M insulation and GORE-TEX fabric lining, these boots are guaranteed to be comfortable and waterproof. The lining of these boots may rub against the calves, so it is suggested that you wear boot socks to prevent direct contact with your skin. They also seem to run a bit small, so you may want to size up a half or even a full size. 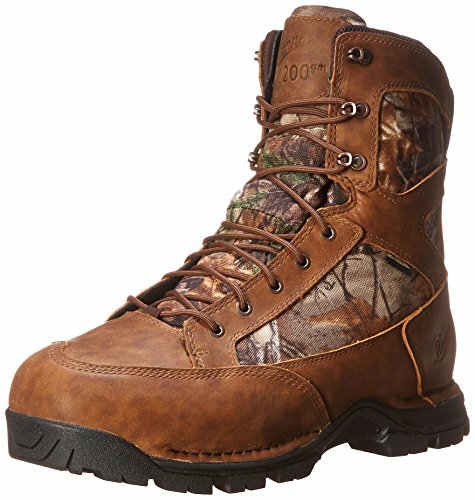 Other than that, these are great boots, ideal for all your hunting or hiking needs. Overall, this is a superb hunting boot that both looks and feels great. They run a bit small, so be sure to size up, and wear proper boot socks to prevent the lining from rubbing against your skin. The shock absorbing midsole and memory foam footbed ensures your feet stay comfortable even with prolonged wear. ScentBan technology kills odor-causing bacteria, leaving your boots smelling fresh. The insulating material is thin, lightweight, and warm, keeping your feet at a good temperature in dry or damp conditions. These boots would make a great addition to any hunter’s collection. 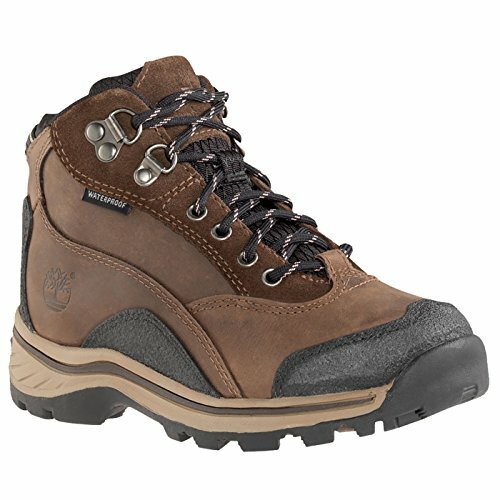 This boot is made from nylon and suede, and is both lightweight and waterproof, keeping your feet comfortable and dry. The waterproof suede leather delivers excellent durability and breathability, with an antibacterial scent control that leaves your boots fresh. An antimicrobial molded Ortholite sock liner ensures a proper fit and an odor-free environment. The low profile rubber sole delivers support and durability over rugged terrain. Measurements for this boot includes a 1.5-inch heel height, a 7-inch shaft, and 0.75-inch of platform height. The sole is durable enough that you won’t feel the rugged terrain beneath your feet, but it also provides a comfortable fit and is light and flexible enough to not prevent your range of motion. These nylon and suede boots are stylish and functional, great for hunts or hikes. Since they are waterproof, they will protect your feet from any moisture. The durable sole is light and flexible to ensure you have a full range of motion when you walk. It is recommended that you replace the laces with ones of better quality, as the ones that come with the boots could use improvement. Antibacterial scent control and an antimicrobial molded Ortholite sock liner ensure an odor-free environment to keep your boots as fresh as the day you got them. This boot is made from rubber and features a rubber sole. The measurements of this boot consist of a shaft of approximately 14 inches measured from the arch, a heel measurement of 1.5 inches, a platform of around 1 inch, and an opening of approximately 16.25 inches around. 4 millimeters of neoprene provide both comfort and heat retention; furthermore, this boot is both waterproof and shock absorbent. The neoprene also allows the boot to adjust to the shape of your feet for a more personal fit, preventing blisters and uncomfortable chafing. 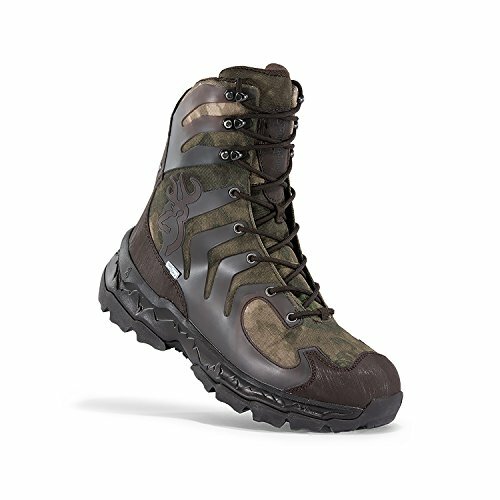 Breathable and lightweight mesh lining keep these boots well ventilated, and a molded outsole reduces weight and improves both stability and range of motion. The rubber exterior provides extra protection from terrain and makes for a completely waterproof and durable boot for any weather. 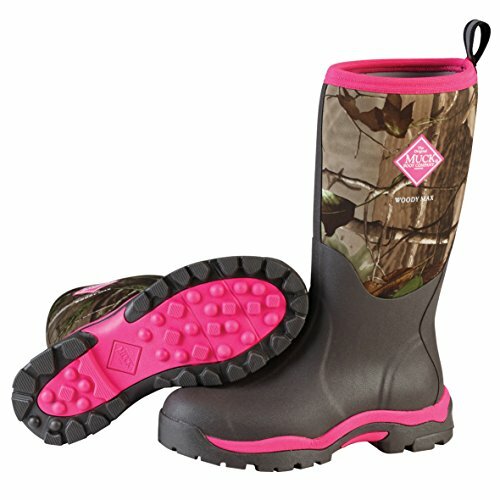 These boots are perfect for female hunters or hikers and will leave your feet protected, comfortable, and dry. A rubber exterior ensures these boots are durable and waterproof, and the breathable and lightweight mesh lining keeps the boots well ventilated. Neoprene helps provide comfort and heat retention, as well as preventing blisters or chafing. These boots do run large, so it’s best to size either a half or even a whole size down. Overall, these are great, sturdy boots that would be an excellent addition to any trip to the great outdoors. These boots are made of leather and feature a sturdy rubber sole. They have 10 inches of tall leather uppers that feature both double and triple stitching to add to the structure and durability of the boot. A custom outsole provides grip and traction, while a 7-millimeter nylon midsole offers a solid foundation for extra stability and support. A durable Windtex waterproof membrane and 400 gram Thinsulate insulation keep your feet warm and dry under even the heaviest of weather conditions. This boot provides excellent ankle and arch support, while still allowing you to have range of motion for your ankle, so walking up steep slopes is not an issue. These boots are a bit stiff at first, as they are made of leather, but once you’re able to break them in and allow the leather to become more worn and flexible, they’re perfect for all your outdoor adventures. Overall, this is a great pair of boots to take with you on your next hike or hunting trip. These boots are made of leather, so you’ll have to allow some time to break them in before going out on a long trek. Once you pass the break-in period though, they’ll feel like they were made for your feet. These boots have excellent ankle support so you won’t have to worry about your feet slipping around in the boot when walking up a steep slope or uneven terrain. They may run a bit small, so it is suggested that you order half a size up. 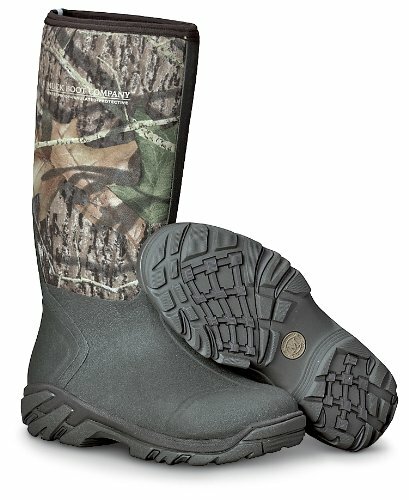 These boots are 100% synthetic and feature a waterproof camo shaft and reinforced toe. The breathable air mesh lining allows for proper ventilation, while the EVA cushioned midsole provides support and comfort for your feet. 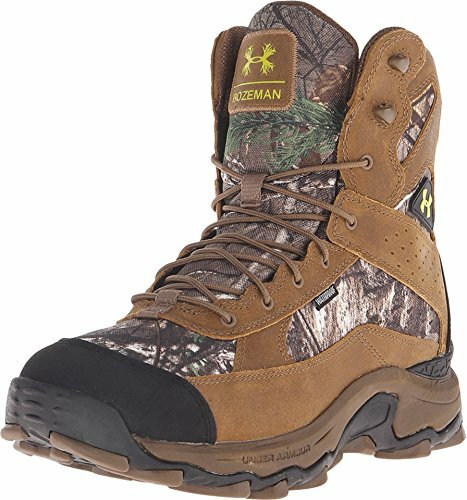 Easy to break in and able to withstand snow and water, these boots are perfect for long hunting trips or hikes. The shafts are very flexible, giving you full range of movement so you can walk up steeper slopes. Though these boots are not insulated, you could go up half a size and make sure you wear heavy and warm socks, since they’ll be protected by these waterproof boots. These boots are comfortable, durable, and can easily be worn for hours on end. These boots are ideal for someone who wants a good, waterproof boot. The shaft is flexible, allowing you to have a good range of motion, and you are also able to tuck your pants into the shaft. They are easy to break in, and the EVA cushioned midsole makes for a comfortable wear. Keep in mind that these boots are not insulated, so if you’re looking for warmth, you may want to pick a good pair of wool socks to keep your feet warm. If you plan on wearing thick socks, it is suggested you size up half a size so your feet don’t end up squished. This pair of hunting boots is made of both leather and fabric, and feature OutDry’s patented lamination process of waterproof membrane, which is bonded to the boot’s outer shell in order to keep feet both warm and dry. The supportive midsole also features a SymmPlate TPU arch for underfoot comfort and stability, while Thinsulate Ultra superior insulation provides warmth that is breathable so the moisture your body creates is able to exit rather than be trapped in the boot. The leather upper of this boot is durable, waterproof, and abrasion-resistant so you can make them a part of your daily outdoor activities for months to come. Overall, these boots are the best lightweight hunting boots you could add to your next hunting or hiking trip. They are durable and comfortable, requiring little time to break in. A waterproof exterior and insulated interior allow your feet to stay warm and dry in various weather patterns. A SymmPlate TPU arch allows your foot to remain stable and comfortable during long excursions, so you won’t have to worry about foot pain. These boots are made from synthetic leather and feature a rubber sole. The dual-texture waterproof material and full-grain leather, featuring protective toe overlay, ensure your feet will be well protected from rough terrain and various weather patterns. A climate control mesh lining and footbed keeps this boot at the perfect temperature, while the EVA foam footbed provides all-day comfort during long outdoor trips. The durable rubber sole of this shoe allows the wearer to walk on various types of terrain without worry of the sole being worn down, so explore to your heart’s content! These boots are an exceptional addition to any kid’s collection if they like to explore the outdoors, rain or shine. These boots aren’t completely waterproof, as the tongue is not sewn to the boot, so water can slip in, but beyond that, they are able to withstand various weather patterns. This boot doesn’t seem to be super insulated, so it may be a good idea to invest in some warm socks to wear with them. The durable rubber sole allows the boot to not be easily worn down, so they can be worn for months at a time on rugged terrain. These boots feature an EVA foam footbed that provides all-day comfort, so hours of walking will be a breeze. Rubber boots are great options for those who may be looking for that waterproof material. The rubber material is flexible, so the shaft gives quite a bit and allows for a good range of motion. There isn’t always insulation though, so if you find yourself with a pair of rubber hunting boots without insulation, you may want to go up half a size and wear wool socks. These boots often can be worn for multiple weather patterns, hail or snow, rain or shine. They are often quite sturdy and can feature insulation that provides extra warmth and protection to your feet. These boots are also often waterproof or at least quite water resistant, so they can be worn on multiple occasions. Overboots are made to be worn over another pair of shoes or boots. They provide extra insulation and protection from the elements that can protect your shoes and feet. These are great for capturing your natural body heat and distributing it around your feet. These boots are often waterproof and are great for locations that may contain grasslands, since the long shaft makes it easy to walk through long grass while protecting your feet. Proper boots are an important addition to any hunt or hike, since your feet are what carry you around various extensive terrain. There are many different types of boots offered on the market, with features such as insulation and extra footbed cushioning. There are different materials a good boot can be made of, such as synthetic material, leather, rubber, suede, or a mixture of materials. Make sure you know what kind of terrain you plan to be exploring so you can plan your footwear accordingly, and give the boots plenty of time to be broken in before taking them on a big outdoor exploration. The weight of a hunting boot can vary, but 2-5 pounds seems to be the average for a good pair of hunting boots. You don’t want them to be too heavy if you plan to have an extensive walk, as it will exert more energy lifting your feet. How Long Will it Take For Boots to Break in? Some boots take a long time to break in, while others can essentially be worn out right away. It is suggested that you start breaking your boots in a few months in advance to when you plan on taking them out for a longer trek. You can do this by wearing them maybe a few hours a day to get them really broken in and ready. Some thin rubber hunting boots probably wouldn’t be the best to wear if you were worried about snake bites, but many other boots should offer protection from snake bites. Those made of leather and rubber are durable and quite thick, so a snake bite should easily be preventable if the right boot is worn. What Material is Best For Hunting Boots? This depends on the type of weather and terrain you plan on hunting or trekking on. If you want a good waterproof and durable boot, a rubber boot is always the best option. A mixture of leather and rubber leads to a good waterproof boot that is also flexible and gives you a good range of motion. Fabric can be a good material as well, depending on what type of fabric it is and whether it is waterproof or not.